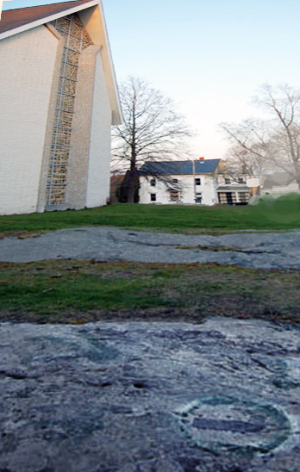 The devil’s footprint is embedded in the rocks of Meeting House Green in Ipswich, and the story of its hellish origin has an element of truth. It is probably a xenolith, confirming that 400 million years ago, Town Hill was in a chain of volcanic islands. On that early fall day he preached a long and energetic sermon of such great intensity that his voice could be heard for miles around. Thousands flocked to the Green. The church being insufficient in size for such a gathering, he made the ledge outside of the church his stage. Behind the pulpit in the church was a large curved mirror, the origin and purpose of which has never been known. Some folks believed that on Sunday mornings the Devil would hide behind it and glare at the people seated before him. On this day, the Reverend Whitefield’s resounding voice outside of the walls, complete with condemnation of Satan and threats of fire and brimstone must have infuriated Old Lucifer to the breaking point. 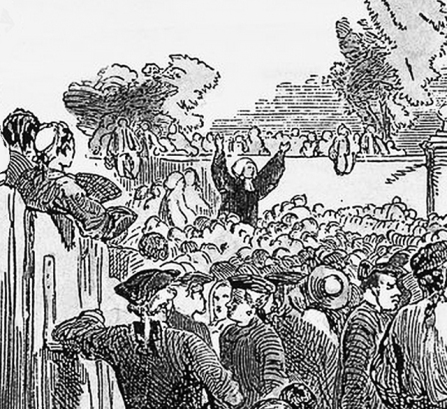 The words were harsher than he could bear, and he burst forth before the startled masses gathered on the hill. What happened next has been told with infinite variations since that fateful day, but it is agreed by all that the devil and the young Reverend went at it, wrestling like maniacs, pushing and shoving each other back and forth. Whitefield gave chase and soon they were face to face at the pinnacle of the steeple with the horrified congregation watching below. The esteemed pastor uttered forth with his commanding voice, accompanied by a mighty push. The devil was hurled to the rocks below, landed on one foot and scrambled down the hill in terrified leaps and bounds, never to return. This was apparently such a normal occurrence for the Reverend that he wrote modestly in his journal, “Tuesday, Sept. 30, Preached at Ipswich about 10 in the morning to some Thousands; the Lord gave me Freedom, and there was great Melting in the Congregation.” News of his evangelical prowess spread throughout England and America, and the “Great Awakening” was born, giving rise to the Methodists, who built a church on the green with an even more massive steeple. The legend of the Devil’s Footprint has a symbolic truth–Town Hill’s hellish origin was a chain of volcanic islands that “floated” here due to continental drift. This is where the story gets really weird! 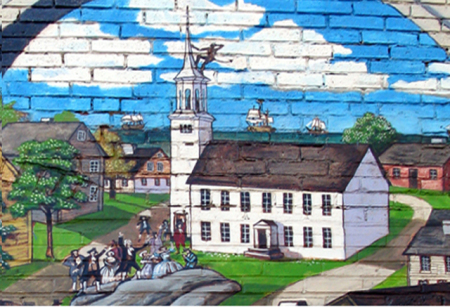 Received so well, the Reverend Whitefield chose to make New England his home. 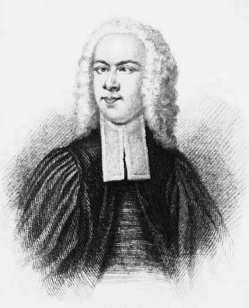 He died on Sunday, September 30, 1770 in Newburyport and is buried there in a crypt under the pulpit at the Old South Church, the very church where he had planned to preach the next day. It is estimated that there have been well over 30,000 visitors to his crypt since it was relocated there in 1829. Visitors are invited to sign the log book located near the crypt. 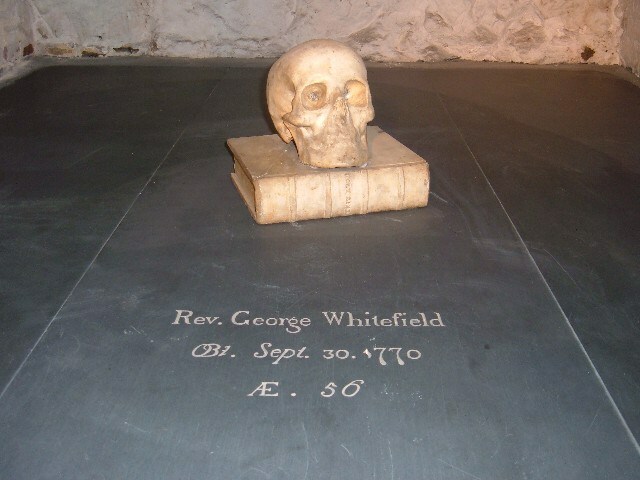 Whitefield’s body was considered a sacred relic, and in 1829 a visitor from England managed to steal a bust of Reverend Whitefield, as well one of the arms from his skeleton. The thief was never apprehended, but the items were anonymously returned twenty years later in a small wooden box. Two thousand people joined the Newburyport procession for its return to the vault, with the exception of a mummified thumb which is on display at the Methodist Archives Center in Madison, N.J.